Description: The renovation on this home is outstanding. Situated on a large 894sqm block in a quiet cul-de-sac. The home has new floor tiles throughout, new kitchen that has never been used, quality cabinetry in bathroom and laundry. New ducted air conditioning system. The single level home has two separate living areas, with the oversized family room spilling out through cedar sliding doors to the covered entertaining area and huge pool deck. It has large living areas, 4 bedrooms plus an office with 2nd entry from the double garage. The master bedroom has a large ensuite with spa bath, and plantation shutters for those summer nights. The pool is a huge 76,000 litres with a shallow end for small children, as well as a lovely slate bubble seat and waterfall. The property has many features including a reinforced storage room to protect items requiring safe storage. The furniture in this home is available for sale if required. Noosa Waters provides a wonderful lifestyle, and is the hub of the area, with only 3 minutes to the Shopping Centre with its wonderful choice of lovely cafes and restaurants, 4 minutes to the Noosa River, and 8 minutes to Noosa's famous Hastings Street and Main Beach. Contact Tom Offermann Real Estate Today!!! 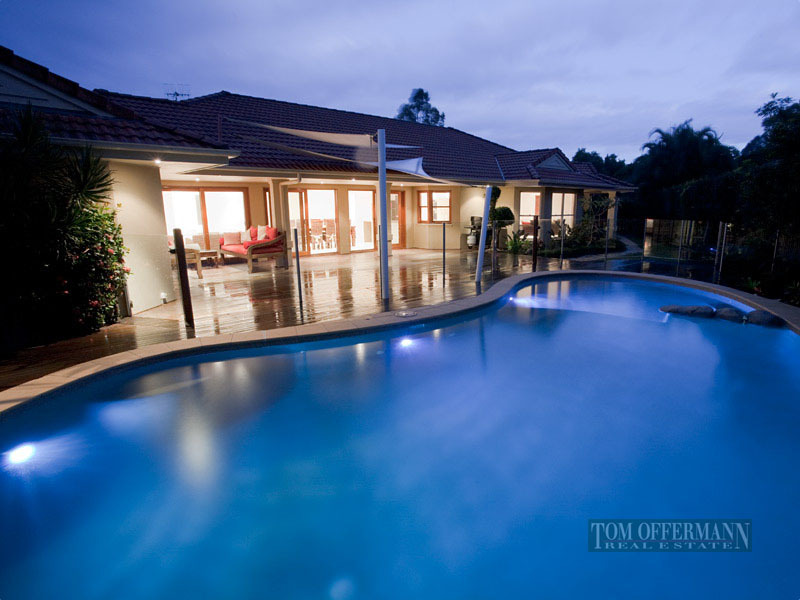 Email Tom Offermann Real Estate Now!